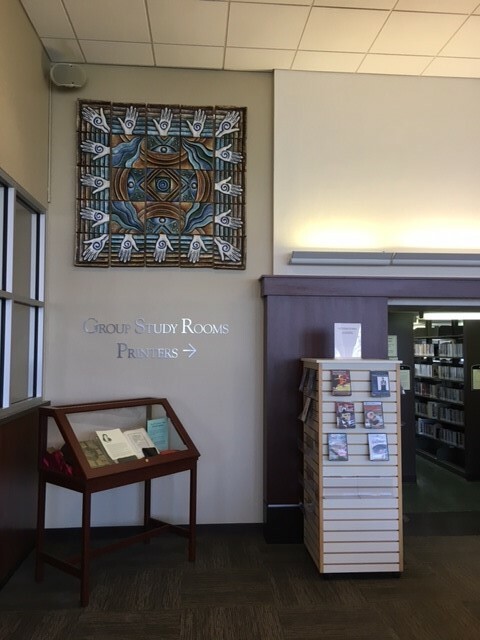 This page documents the art pieces that are displayed throughout the library. in the Group Study Room area on the upper floor. The Bishop Quarter Room contains a Student Art Gallery. The material that rotates through this room is intended to provoke conversation. view the paper books on this topic. view the online books and movies on this topic. we also have a small Manga collection in the Main Room under the windows. There is often an ability to send comments to the creators ... and the creators or others can respond on this page. There are also selected and associated art books on display throughout the room. The Art Department places framed student art on the second floor, in the hallway as well as in some of the group study rooms. We will include descriptions of these pieces on this page. Art is hung throughout the Main Reading Room space. 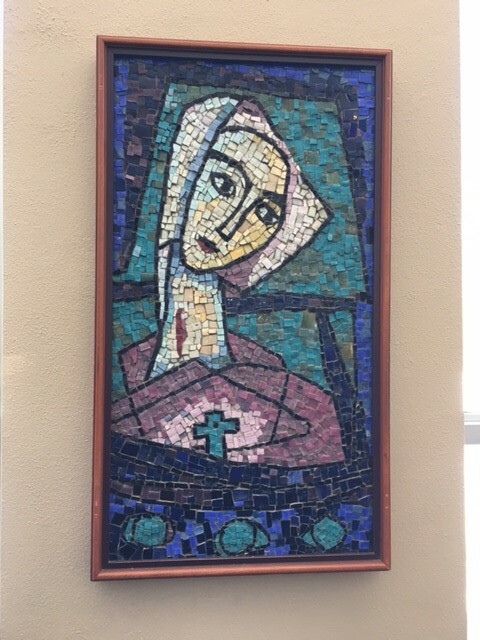 Some of the art was created by the Sisters (the mosaics along the window columns and the watercolors near the Haddad Room). Other art was created by students and Alumni. Sister Solina has been drawing or painting since she was a little girl. Originally from Wisconsin, she joined the Mercy Sisters in 1934 and taught for a time in Catholic schools in the Archdiocese of Chicago. She studied at the Art Institute in Chicago and earned her masters in fine arts at Sienna Heights in Michigan. She created the St. Xavier College shield in 1952, which is still in use today. 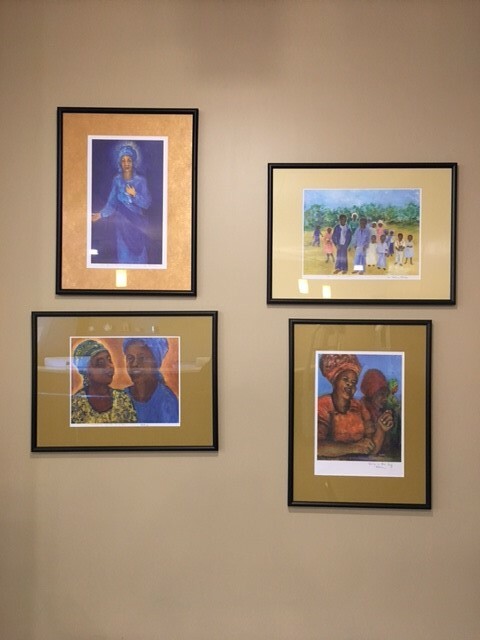 In 2008, at age 95, Sister Solina created a series of portraits titled “Seeing the Kingdom of God in Nigerian Women.” The inspiration came from photos her cousin Esther Hicks, director of Catholic identity and mission for the Office of Catholic Schools, took on a trip to Nigeria for a partnership with Nsukka schools. Paintings and prints of the women were sold to raise money for the effort. These four watercolor pieces are hung near the entrance to the Haddad Room. She’s worked in different mediums — pencil, enamel, metal, watercolors — but acrylics are her favorite. Her mosaic is hanging on the West-most column along the north windows, along with the other two mosaics on the other columns. The library owns a copy of the videorecording: Sister Solina Hicks : a retrospective. Chicago : Saint Xavier University, 2010. In 2016 the library accepted the piece which was made during a residency by Indira Johnson at the Kohler Factory in Kohler Wisconsin. It is made out of stoneware and measures approximately 5x5. Indira Johnson is originally from Mumbai, India. In 1965 she was awarded a scholarship to attend Saint Xavier College. It was arranged by Mother Teresa who had just visited Saint Xavier and worked with her mother in Mumbai. Indira studied art and ended up transferring to the School of the Art Institute of Chicago where she received her MFA. Saint Xavier College was very supportive and allowed her to work on campus and live in the dorm during this period. Giving Praise deals with the same issues that have preoccupied Johnson for the last two decades – the growth towards a spiritual existence as an individual and as part of the human continuum. Hands and feet, symbols that appear in practically every culture since the dawn of civilization, continue to dominate Johnson’s work. Hands are the principal way that work is accomplished and signify the action of karma. Feet guide one towards spiritual growth and identity. Throughout her work, Johnson has tried to evolve a vocabulary of signs to express the human relationship to the universe. The Spirit Will Teach You All Things is the name of the seven stained-glass windows that loom majestically over the main reading room of the Library. The late Richard J. Daley, the former mayor of Chicago and the father of Richard M. Daley, donated the windows to Saint Xavier University in honor of his father, Michael J. Daley. 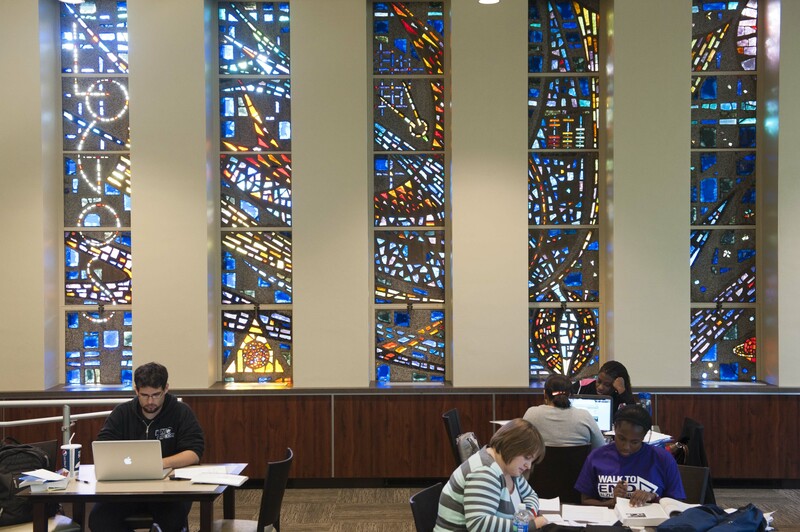 St. Louis artist Robert Frei designed the exquisite windows as an artistic rendering of Saint Xavier’s commitment to the liberal arts and sciences. Symbols for the classical trivium and quadrivium are embedded in the windows. From left to right, the windows represent grammar and art (quill), rhetoric (LOGOS which means word or argument/proof), logic (sphere of particles within a perfect sphere...the world of facts and the process of ordering through reason and proof), geometry (compass and geometric design made up of lines and dots), mathematics (abacus used for counting), astronomy (sun, moon, and stars), and music (the proportions of numbers, an application of arithmetic - the properties of numbers). The Holy Spirit, portrayed as a dove in flight, soars over the whole to signify wisdom, the goal of all learning. The windows are made of sculpted glass, or "chunk glass" - thick chunks of pure colored glass cut to size and chiseled to produce tonal qualities. The pieces of glass are set in a tan plastic base, polycrete, into which the artist, Robert Frei of Saint Louis, has imbedded countless tiny chips of marble for purposes of textural variety. At night, the polycrete base presents the design, as the glass aspect of the window recedes.